The collection contains documents relating to both World Wars, but the centenary year of the outbreak of the Great War was considered an appropriate time to open the new museum, with most of the available space reserved for exhibits related to that earlier conflict, some of them unique and extraordinary. The first part of the museum was opened with an emphasis on inclusivity, as its creator wished. It was not a war museum as commonly understood, but a museum of twentieth century society at war, with its demons and horrors, struggling in hope along the long and difficult path towards a lasting peace. The ground floor of the restored main exhibition hall houses a permanent exhibition entitled "1914-1918, THE FUNERAL OF PEACE", dedicated to the history of World War I. It opens with the funeral procession of Franz Ferdinand, heir to the Austro-Hungarian throne, who was assassinated with his wife in Sarajevo on 28 June 28 1914, an event that sparked the Great War. It continues with a display of gunnery and military vehicles of the period, accompanied by explanatory texts and photographs, plus propaganda posters, weapons and other contemporary items. 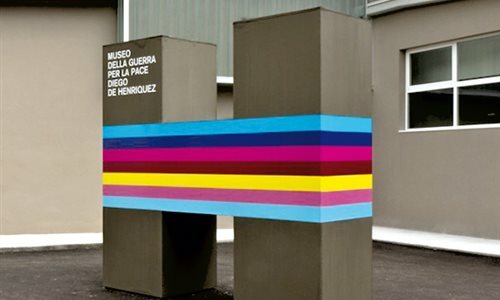 An exhibition on the upper floor, "A Hundred Years of War", summarises the story of Trieste, intertwined with the life of Diego de Henriquez, from the early twentieth century to the present, including World War I, the Fascist period, World War II and final unification with Italy in 1954.